I can feel the emotion that you created on this page! I really love the movement down the left, but how you cleverly placed the folded background paper to draw the eyesight over to the other side of the page! I'm so sorry that you are struggling to give him the help that he needs. Praying for a change of heart and acceptance in this new chapter of his life. I'm so sorry for the hard times. It's beautifully told. I'm so sorry that you're going through this. It is impossibly difficult to watch the people we love make decisions that we know aren't good ones for them. I hope things get better. 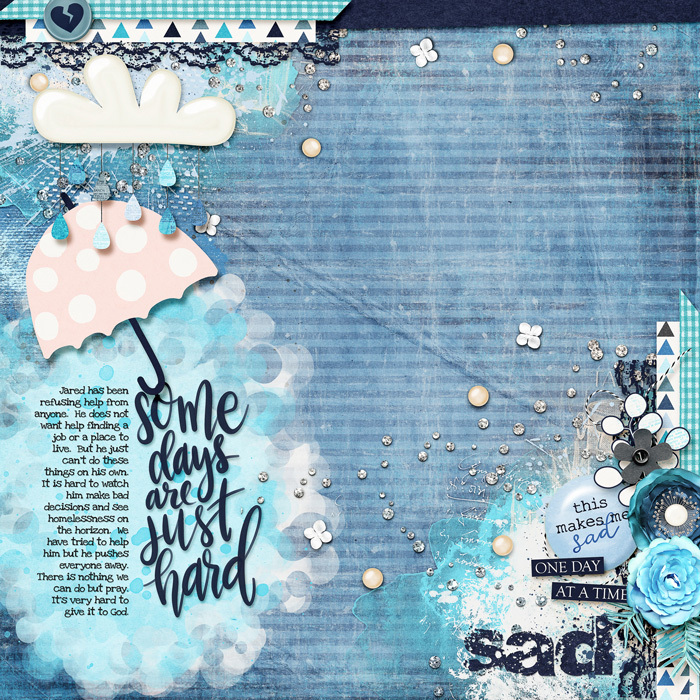 Your layout is beautiful... from the color choices to the gorgeous clusters to the heartfelt journaling. Oh no, it's so terrible when you want to help but are not allowed. Hopefully, things will turn and get better. Beautiful way to express your feelings! I'm sorry that you are having such a tough time - it is very hard to watch those we love made bad choices for themselves. Hopefully things will turn around and get easier very soon. Very poignant layout - beautifully done! My first thought was how eye catching this layout is! Very beautiful. I am so sorry for the tough situation you are in - watching your kids make bad decisions is one of the hardest/saddest things we go through. I'm so very sorry you're going through this. We are having some of the same issues with our older son. It's very hard to to through. I'm here if you ever want to chat!! Your LO is beautiful...from the hanging cloud raining on the umbrella to the cluster on the opposite side. Your journaling beautifully captures the struggle you are going through. This is absolutely beautiful and heartbreaking. I feel this way so often with my students when they are going down bad paths and refusing help or encouragement. You scrapped this pain in such a stunning way.